Western representative democracy is a system that has, at its institutional heart, remained unchanged for hundreds of years. Citizens lend their voices to a politician they hope will remain true to their interests until the next election. Where further engagement is possible, it is haphazard and outmoded. With technology developed by Democracia en Red, DemocracyOS hopes to fundamentally change the way we interact with our elected representatives, and with each other in political debate. The team started working on the online tool in Buenos Aires, has seen it used to great success since, and is now one of the few non-profits that were funded by prestigious tech start-up accelerator Y Combinator in 2015. DemocracyOS is a collaborative, open source decision-making platform used by governments, individual parliamentarians, political groups and more to host debate on new laws and bills. Tunisia used the tool to help inform the creation of its national constitution, and the Mexican government chose to use DemocracyOS in the first step to forming its open government policy. The platform is now available in over 15 languages and is self-hosted on its own servers, or accessed as an app through the organisation’s website. Source code is all on GitHub, and DemocracyOS as a group encourages its use in workshops and programmes, as well as government. As a user, you are able to build proposals, join debates that filter out the trolls, and vote with a click of a button. DemocracyOS holds the potential to revolutionise the political process. By delegating authority topic by topic to our elected officials, rather than granting overarching decision-making powers, we are empowered to effect change now – no longer having to wait till election time, and significantly reducing apathy. It all comes down to community, so have a look and see if you can help yours. 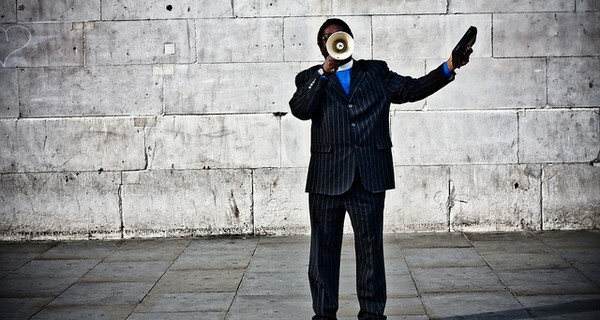 Image ' With A Megaphone by a wall' courtesy of Garry Knight.